It has been gradually getting easier to get Faith to wake up and go to school. She used to, in the past, struggle kicking and screaming while we attempt to get her out of bed. These days, it has been reduced to the occasional whining or 赖床 in Ch1nese speak. I don't think my last hantam session has anything to this but I think more of the fact that she has grown up and matured to understand that going to school is not that a horrid thing after all. This is a picture of her doing her homework the night before school. She is learning to write and doodle. I enjoy watching her do her homework. It brings a smile to my face know that she is learning and getting smarter right before my eyes. She still has a short attention span where I have to break down writing 20 times into 2 sessions of 10 with a short 5 minute goof-off break in between. But looking at the progress that we have come thus far, this is good enough for now. Looks like my dream car will have to wait as I guess I have to start saving for her college fund. p.s. It's official. She is right handed. Everton: She is in K-2 now. 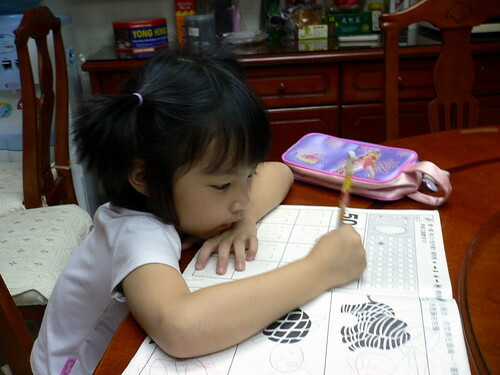 She is diligent coz I am sitting right next to her and will wring her neck if she try to run away from her homework. mht: Dounch anyhow say me hor. What pressure? She like me to be around when she do her homework. p.s. Btw, quite surprise to see you at CowBoyBar. Good to see you! How are you Jay ? moi ca va, ça fait longtemps que je n'étais pas venue ici.. tes enfants sont toujours trés beaux, bon anniversaire à ton garçon ! le mien aussi a son anniv. le 28/07..Bisous.. je pars en guadeloupe à la fin de la semaine. Jaslyn: Well, she was tired by the time she got to the dinner place anyway. Next time lor. aurore: Welcome back! Happy Birthday too! Have a safe journey to Guadeloupe.